Known as the ‘Warlpiri Warrior’, the ‘Jurrahcane’ and ‘Cougar’, Liam Jurrah is a rising star of the AFL, known for his startling displays of skill, artistry and the ‘deadly’ impact of his football ability. But despite Liam’s prodigious talent, he is a relative newcomer to the AFL. This book tells the incredible journey travelled by Liam, a Warlpiri man, from the remote Aboriginal desert community of Yuendumu to the MCG, as the first fully initiated Aboriginal to play football at an elite level. 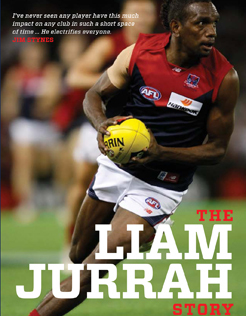 Written by the man whose family provided a home for Liam when he first moved to Melbourne, this is the story of how Liam learned about life in the ‘big smoke’, his time at Collingwood and his recruitment by Jim Stynes and the Melbourne Football Club. Along the way the book describes how the author and his family came to understand and treasure the richness of Liam’s Warlpiri culture.